See the end of this post for links to previous posts in the series. On the drive home from the overnight investigation at Belvoir Winery, I was tired, but on a high from having such a cool experience and meeting some really cool people! I already had blog posts planned out in my head. I knew I had some amazing footage on NightShot video, including the one and only Britt Griffith using and demonstrating the use of my spirit box, and hours of very fascinating possible spirit communication with flashlights in two different locations. 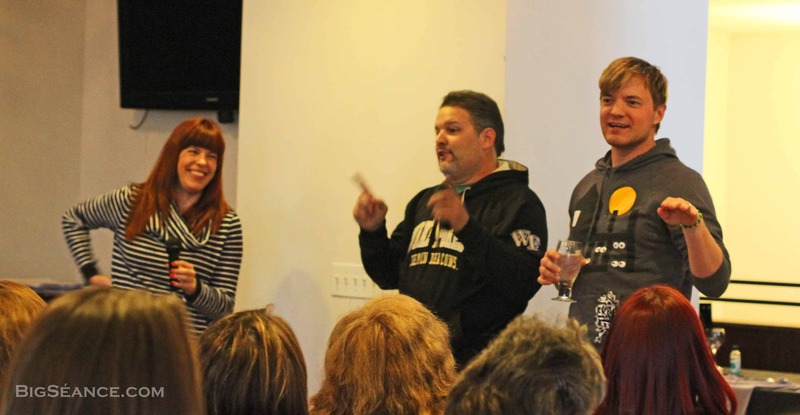 Amy Bruni, Britt Griffith, and Adam Berry having a good time with guests at Belvoir Winery. But what was I MOST excited about capturing? 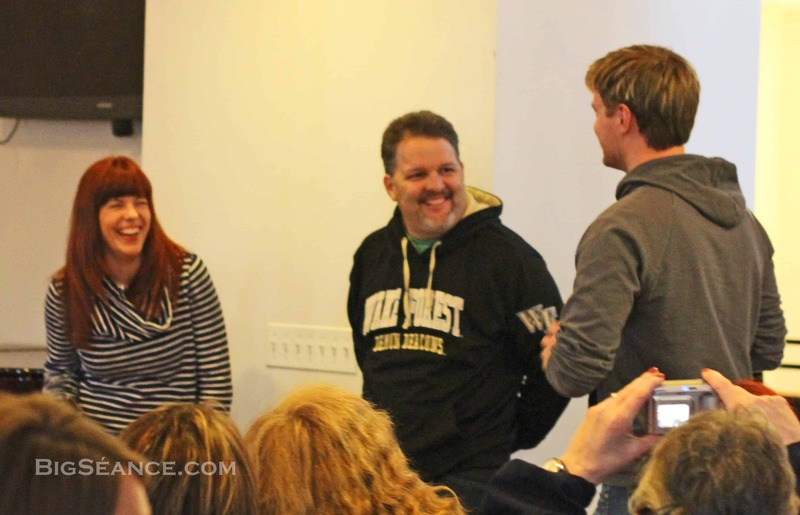 There was a brief period of time where the adorable and amazing duo, Amy Bruni and Adam Berry, joined my group for part of the investigation. Since I happened to be filming, and since they were standing right next to me, I took that opportunity to turn to capture both of their faces in MY VERY OWN NIGHTSHOT! Who gets the opportunity to do that? This was all happening as we were listening to my spirit box in the corner. As I quietly mentioned to them how big of a moment this was, they both hammed it up with a pose and a smile, just for me! Gold, right?! Freaking Elvis moment! And I KNEW that the screen shot was going to be featured right here on the blog. Well… clearly that screen shot is missing. And clearly I’ve misled you to believe that this post would include amazing evidence. But just wait. The story, though very mysterious, continues. Not long after my return home, I hooked up one of my two remaining NightShot camcorders to the computer, ready to upload all of the footage from the three tapes that I used during the investigation. Suddenly, the all too familiar beeping and error code began to show up, which sometimes leads to the tape getting stuck in the camcorder. I didn’t panic. Anyone familiar with these camcorders knows this exact frustrating error. Once I got the tape out, I knew that since I had another camcorder, I’d surely have no problems. The same thing happened with the other camcorder. I tried one of the other tapes. Same problem. Another tape in the camcorder. Same problem. I couldn’t even play or rewind the tapes. An hour and lots of frustration and google searches later, I gave up and went to bed. Fortunately, I know Robert Painter from Tape2DVD. He can convert anything to the modern age! To make a long story not as long, Robert tried everything he could. What was on the tapes? Snow. Snow with a counter that would track the time to the very end of the tapes. Robert informed me that new tapes that have not been recorded on simply don’t play, and there wouldn’t be a counter, therefore clearly something had been recorded onto each tape. You should know that as I recorded that evening, I used the pull out LCD screen that allows you to see what you’re filming. In fact, since much of our investigation was in the dark, that’s how I found my way. When you’re recording, it makes it clear with a red dot on the screen. I saw it each time. The next thing you should know is that I reuse my tapes. Two of the tapes were not taken to the very end, therefore most likely, Robert should have found various leftover footage from past investigations at the end of those tapes. This was not the case. Oh please. Like that’ll happen. Most of us have always heard that you should keep magnets away from things like tapes, hard drives, credit cards, etc. This apparently also includes strong electric currents, or any kind of electromagnetic field. Even though this is common knowledge for many people, I don’t think anyone really ever expects it to happen to them. You should always be careful around storms and lighting, but no one ever expects to be struck by it. Could some kind of strong source of electricity or exposure to a magnet have erased my tapes? And if so, is it common for them to have been erased so perfectly? Other than a few small gadgets, batteries, flashlights, and more tapes, I didn’t have anything in my bag that would have caused this. I can’t even think of anything that I would have been around that night that would have fit this description. Now I know what some of you are thinking… and I’ve thought about it as well. Is Belvoir Winery truly so active that the spirits used or manipulated so much energy for communication that it erased all of my video tapes? Did they? Or… is there some sort of conspiracy? Perhaps someone involved in the planning of the event doesn’t wish for there to be video footage leaked to the public? Did Amy and Adam decide to break out the tape-erasing magnet because it wasn’t a great hair day? (Ohhh that would make me cry.) Did my equipment bag get bathed by some kind of magnetic shower while I wasn’t looking? I truly am boggled by all of this. I don’t even know what to think. I told Robert to save the tapes for me, just in case aliens drop by with the abducted footage one of these days, or maybe in the future we’ll have space-age technology that will unerase tapes. …until then, I’ll include this place holder to represent the NightShot screen shot of Amy and Adam. Screen shot of Amy and Adam during the investigation of Belvoir Winery. I can’t lie. I’m super bummed, but maybe the absence of evidence is evidence itself? What are your thoughts? P.S. Though I did not run audio for every part of the investigation, I do have audio for much of it… and it exists in digital format and was not erased. Stay tuned. This entry was posted on Friday, April 11th, 2014 at 1:12 am	and tagged with active, adam berry, amy bruni, amy bruni and adam berry, belvoir investigation, Belvoir Winery, belvoir winery liberty missouri, belvoir winery liberty mo, belvoir winery/odd fellows home, big seance, blogging, britt griffith, britt griffith used my spirit box, camera footage, conspiracy, do magnets erase tapes, dream, electric current, electricity, electromagnetic field, electromagnetic frequency, elvis moment, emf, energy, error c3122, flashlight, flashlight communication, footage, ghost, ghost hunt, ghost hunters, ghost hunting, ghosts, ghosts can do that, haunted, haunted locations in missouri, haunted locations in the midwest, haunted midwest, haunted missouri, investigation of belvoir winery, magnetic, magnets, magnets and tapes, magnets erase tapes, mystery, night shot, night shot video, nightshot video, nightshot with amy and adam, odd fellows home, odd fellows home liberty missouri, odd fellows home liberty mo, paranormal, paranormal evidence, paranormal investigation, paranormal tv, place holder, robert painter, screen shot, screen shot with amy and adam, screen shot with amy bruni and adam berry, screenshot, seance, sony night shot, sony nightshot, spirit, spirit communication, spirits, syfy, tape 2 dvd, tape conversion, tape to dvd, tape2dvd, tapes erased, taps, the drive home, the evidence, the evidence sort of, video footage and posted in General, Ghosts in General, Haunted Spots, Paranormal Evidence, Paranormal Fun, Paranormal Investigation Topics, Paranormal TV, Spirit Communication. You can follow any responses to this entry through the RSS 2.0 feed. « Belvoir Winery/Odd Fellows Home: Amy, Adam, Britt, and Chip! Although you have no evidence of evidence…it was quite an amusing post. You never know what could have happened ~ that’s where the mystery begins… Thanks for the post! Darn! I was looking forward to seeing what you captured! Well when the aliens return the footage… or when some genius kid invents a way to unerase tapes, maybe you’ll see it. 🙂 I’m keeping the tapes until then. I’ve had stills disappear in the graveyard before. It’s sounds like a lame excuse to blame something paranormal, but you have to consider it. Either way, I feel for ya! Nice post though. At least you don’t sound too too frantic. Lol…there might have been EVP on those tapes. I know. I just got them back a few days ago. The only problem is now I have no ability to play them. I still forgot to ask Robert if sound accompanied the snow.